Our home away from home for 8 fun-filled days! To celebrate our 27th wedding anniversary, my wife and I took the 8-day "Mexican Riviera" cruise with Norwegian Cruise Lines... with visits to Acapulco, Zihuatanejo, Ixtapa, Puerto Vallarta, and Cabo San Lucas. Of course, we had a great time! The pool and hot tubs are definitely fun! This picture shows what is just to the right of the previous picture. with tables for eating under the sun, and lounge chairs for working on your tan. Several times during the cruise, they barbecue out here. During our stop in Acapulco, it was still warm even after the sun went down. 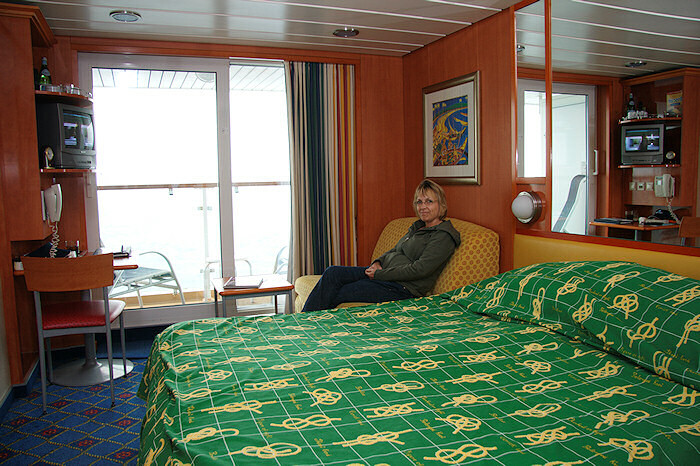 others chose to enjoy some of the comforts of the ship. In the background, you can see the lights of the homes on the hills overlooking Acapulco Bay. In the upper right, you can see the windows of the ship's best suite... which goes for $12,000 per person! It's got 3 bedrooms, as well as a huge private patio with a private pool and hot tub. This is lower level of "the grand atrium". There's actually a lot more to it than I could fit in one picture! What you see one floor above the lobby is the "Endless Summer" Tex-Mex restaurant. showing the staircase I was standing on to take the previous picture. A 3-piece band, "The Manila Trio", frequently played here... and they were really good! 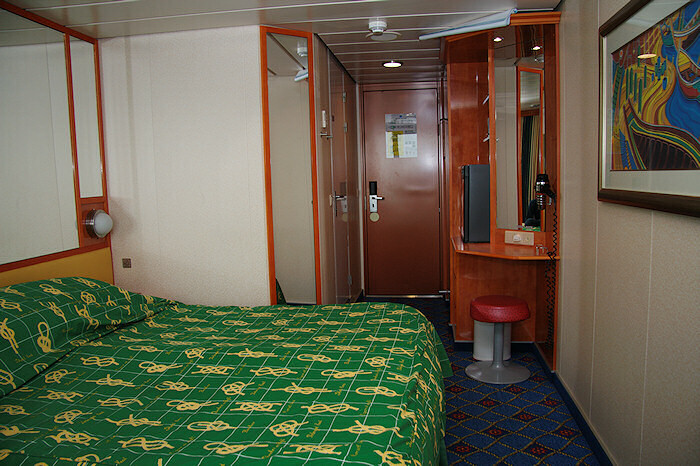 Here's a look at our cabin, which was room # 10558. This is what is known as a (category BA) balcony cabin. We spent a LOT of time out on the balcony enjoying the view and the weather. Looking the other direction, away from the balcony and towards the bathroom, closet, and entryway. Personally, I don't agree with their decision to decorate the rooms in a nautical theme. I think it's loud and tacky. I think they should just do it like a tastefully decorated hotel room. was decorated a bit like the old food courts they used to have at K-mart stores. I didn't really think the food was that good, either! 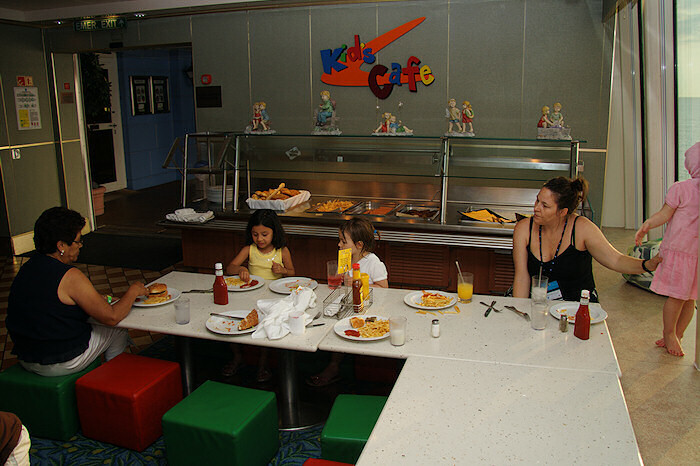 A small section of the buffet restaurant is set aside just for kids. The tables and chairs are kid sized! It's hard to tell from the photo, but they're a good foot or so lower than a normal table. No matter what the adults are being served, there are always hot dogs, hamburgers and French fries available here. Here's another area of the ship that is just for kids. They have their own pool, hot tub, and mini water slide. Right next door to the kid's pool is a place where you can get real ice cream. Luckily, this is NOT just for kids! After a few days, I learned that if you just ask for a "strawberry ice cream cone" (my favorite) they only give you one scoop. So, I started specifying that I wanted two scoops! so I bought a package of three and a half hours of Internet access for $100. from many public areas of the ship... but not from your cabin. 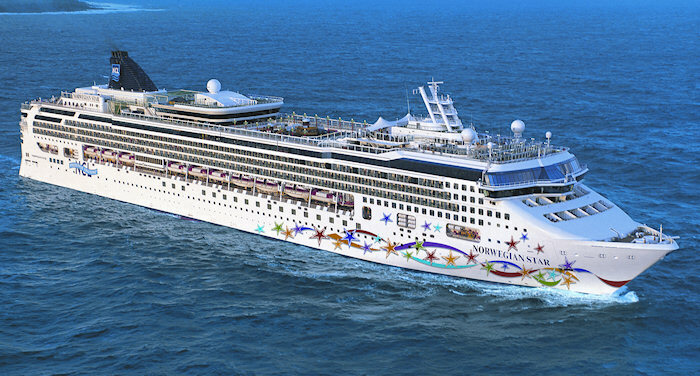 My hat is off to whoever designed The Norwegian Star. noticing little things about the ship that were better than other cruise ships I had been on. 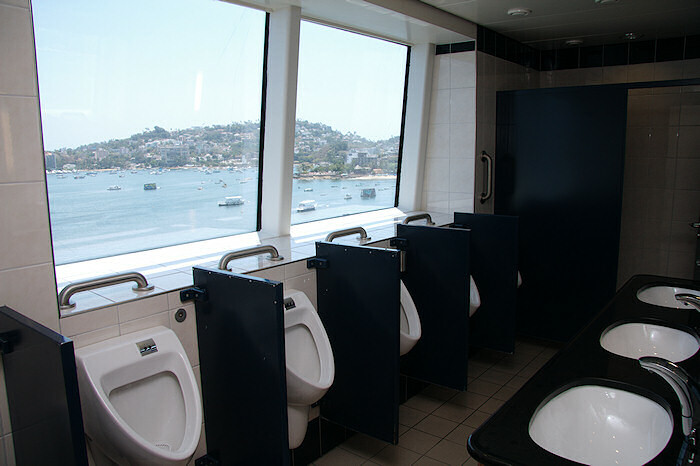 A men's restroom with a million dollar view! The public restrooms on the Norwegian Star are way nicer than the ones on other ships I've been on. 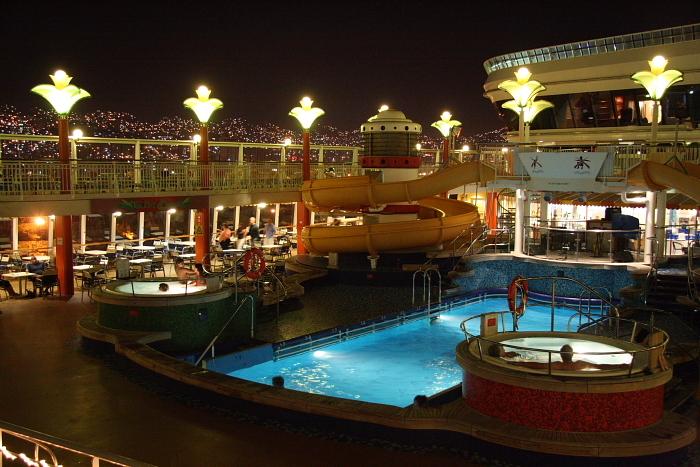 Here we are docked in Acapulco, and WOW! how about that view of Acapulco Bay from the men's room?! The ship is especially beautiful at night. I bet people on shore are so jealous when they see her! 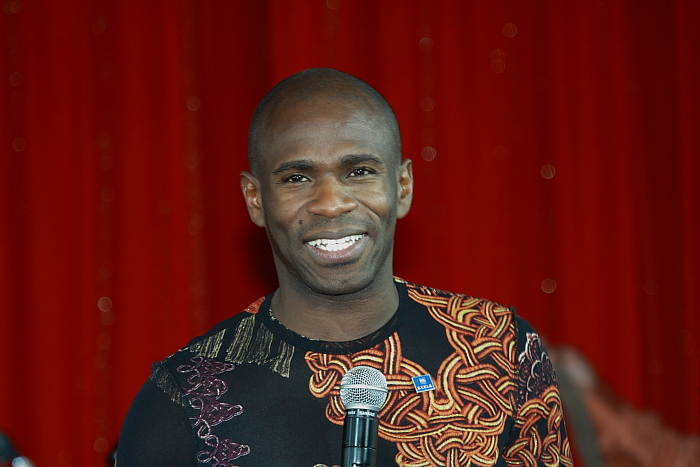 Ricky Matthews was the Cruise Director. He's funny, and kept us entertained! 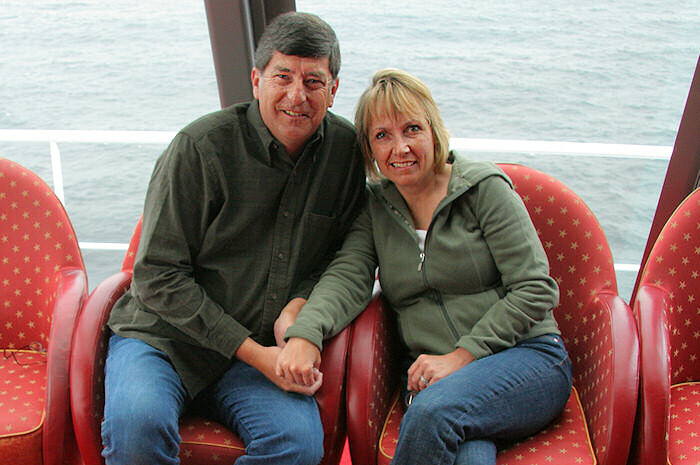 My wife and I posed for a picture in the Spinnaker Lounge, at the front of the ship. With big windows from floor to ceiling, this is a great place to see the sights if it's too hot or cold outside. Fish hang out in the shadows and around the rocks, so that's where we snorkeled. We saw a LOT of very cool looking fish, but I failed in all of my attempts to get pictures of them! 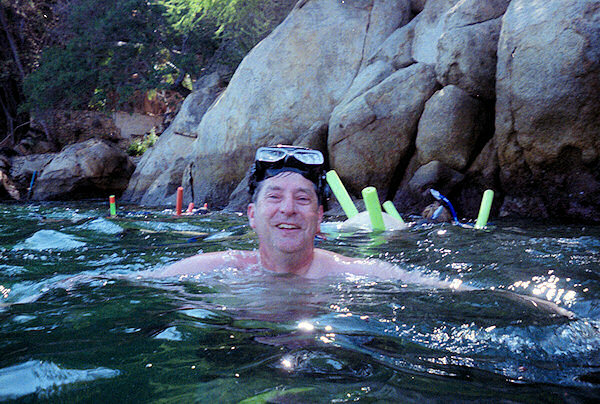 We enjoyed the "Captain's Choice" snorkeling excursion in Acapulco... in fact, it may just have been the highlight of the whole cruise! 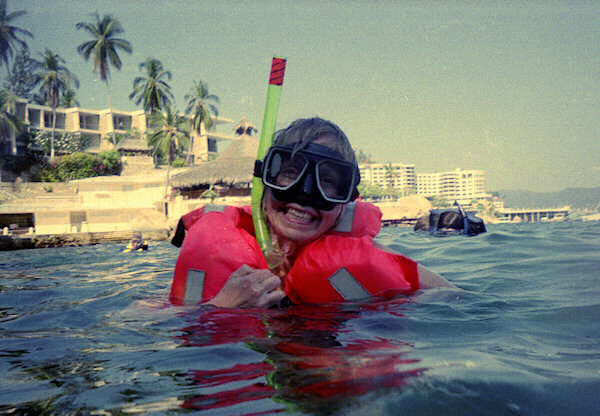 You get off the cruise ship, meet up with the rest of the people who have signed up for the same snorkeling excursion, and then hop on to a small boat which takes you out in to Acapulco Bay. 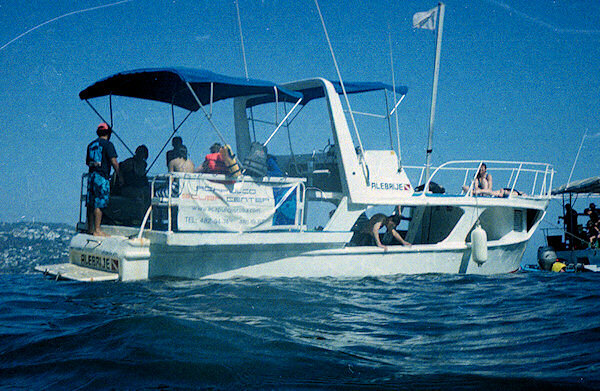 It's called the "Captain's Choice" snorkeling excursion because the exact destination will depend on the particular conditions that day. In fact, after the boat headed across the bay to the captain's favorite location, he checked the conditions in the water and decided that there might be better snorkeling at another spot. So, we went and looked at another location. It was a little murky there, too... so we moved one more time before he was finally satisfied that we had found the best spot. 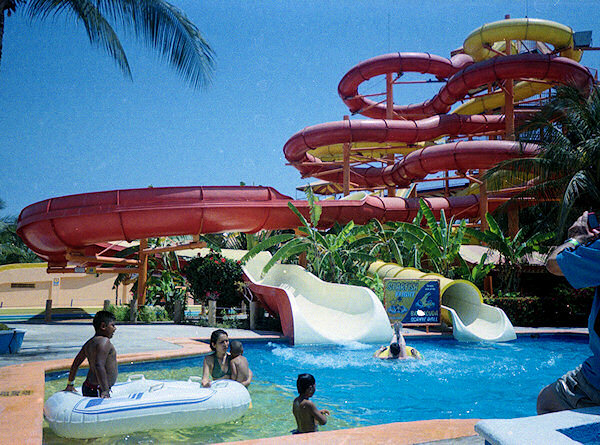 floating around on inner tubes, and sliding down water slides. It was fun! If you look real carefully at this picture, you can see me at the base of the water slide. I just splashed down (backwards!) after a wild ride! Note the color of my legs compared to the others in the water!!! 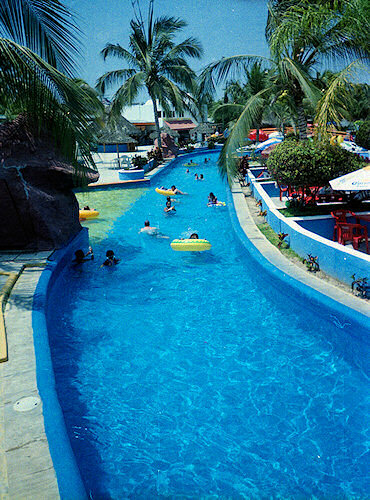 I liked the waterslides, but Kellyn preferred just floating down the "river"
on top of one of those big yellow tubes! My wife and I have a soft spot in our hearts for Macaws. 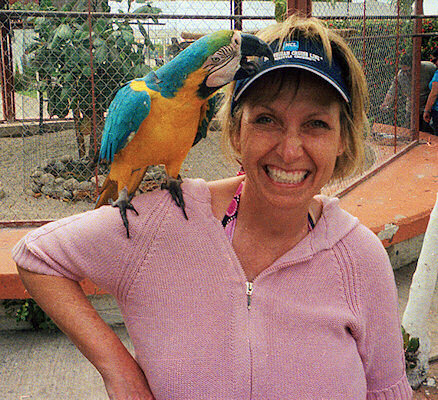 We were delighted to find two different places in Puerto Vallarta with Macaws on display. 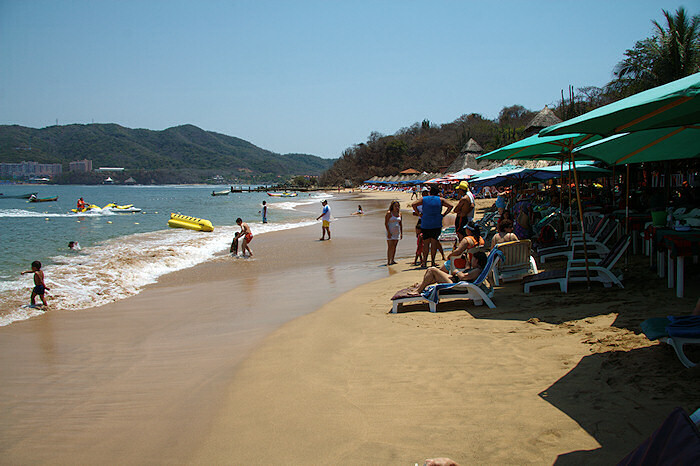 After the ship anchored off Zihuatanejo, we took an excursion to "Isla Ixtapa"
We enjoyed swimming in the warm water, drinking under the umbrellas, and laying in hammocks. I shot this photo from our balcony when the ship was in Cabo San Lucas. Everywhere you looked, there were people having fun! The big rock you see is the last rock at "Land's End" at the southern tip of Baja California. 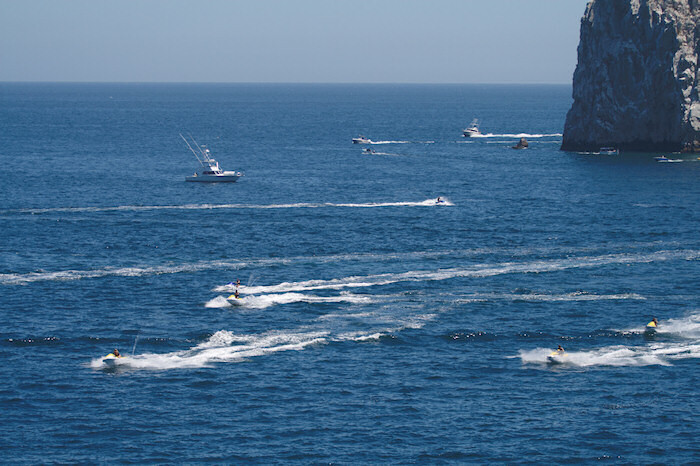 We had just been to Cabo San Lucas a few months earlier, so we decided to explore on our own. 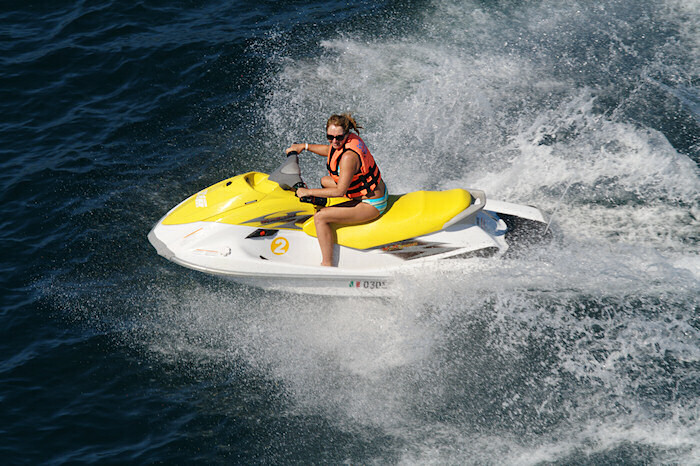 In retrospect, we should have rented jet skis... it looked like an awful lot of fun! 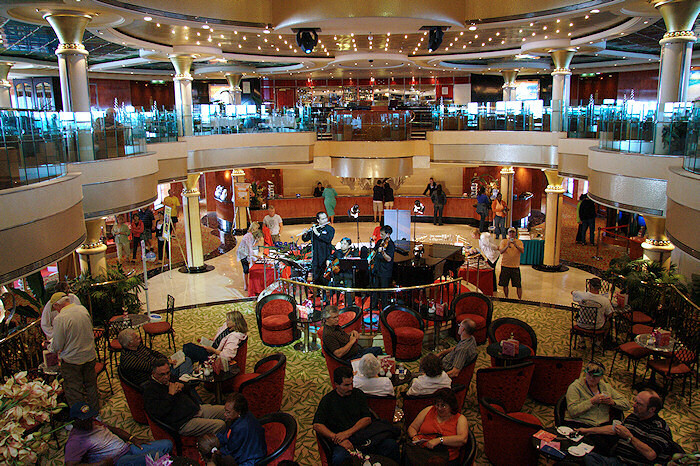 Our April 2008 cruise with NCL on the Norwegian Star was just 3 months after we had done a similar cruise on board the Carnival Elation... so it was easy to make comparisons between the two cruises. Better itinerary. 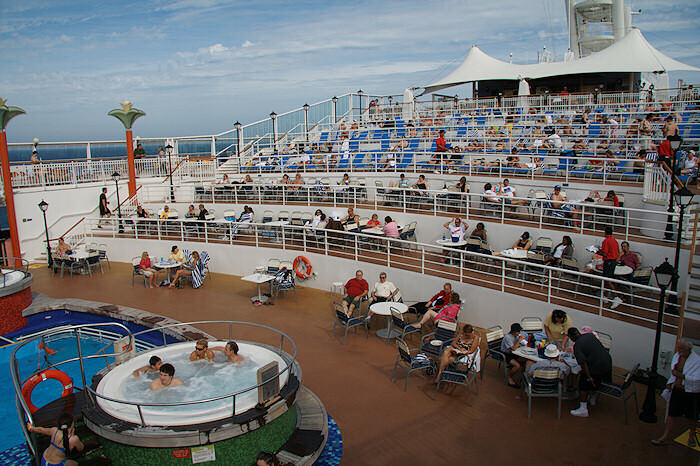 Because the cruise is 8 days long, the ship can stop at more ports, and they're more interesting places, too! 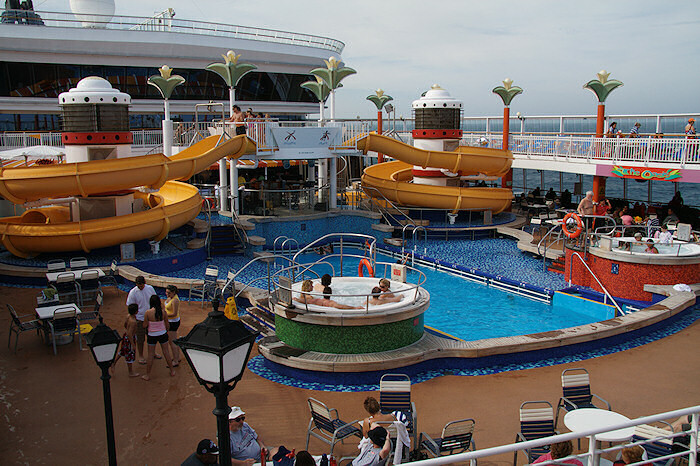 The 5-day Elation cruise only stops at two ports, and one of them is a total waste of time! Freestyle cruising! Eat when you want, and only with people you want to eat with. You never get stuck at a big table eating dinner with a bunch of strangers and having to make small talk. Also, the dress code is more relaxed at dinner, even on formal night. Faster debarkation process, if you are willing to haul your own bags. We ended up getting off the Star in about an hour less than it took to get off the Elation. Better musical entertainment. 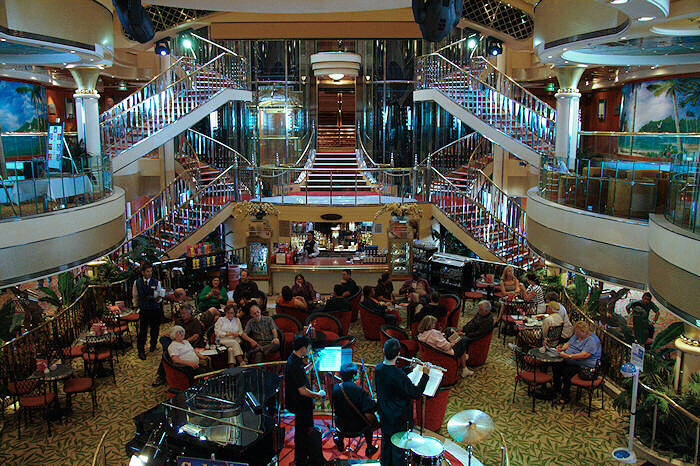 Both ships had several places where you could go and see live music performed... we just enjoyed it a LOT more on the Norwegian Star. There wasn't a single musical act on the Elation that we particularly enjoyed... but on the Norwegian Star, there were actually several! The overall design of the ship is nicer. There were big things like way more balcony cabins available, and there were many neat little design features, too... like having a glass shower door instead of a shower curtain. 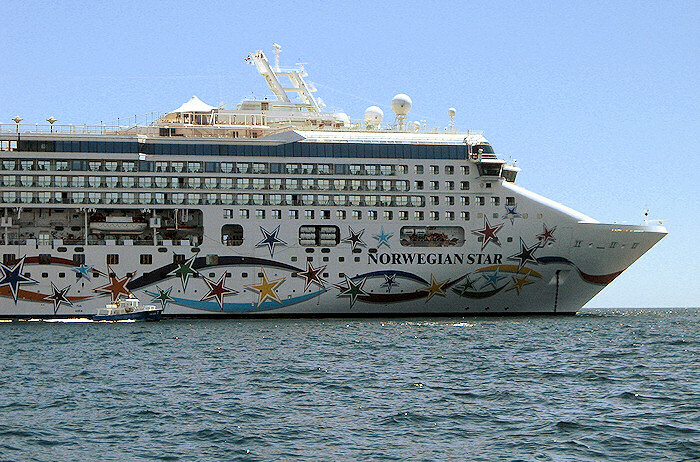 I'd like to give a pat on the back to whoever designed the Norwegian Star, for a job well done. It's a newer ship, so I think it incorporates a lot of "lessons learned" from previous ships. Faster Internet access. 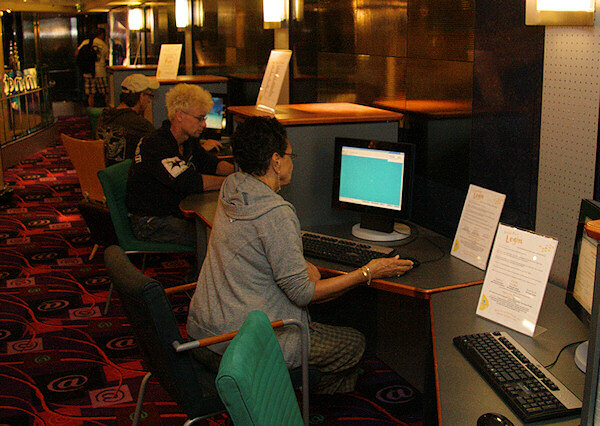 You could buy Internet access on both ships... but it seemed to work better on the Star than it did on the Elation. No mystery foods at the buffet! There's a little label above each food item in the buffet line, so you never find yourself wondering "what the heck is that?!?" Real ice cream! 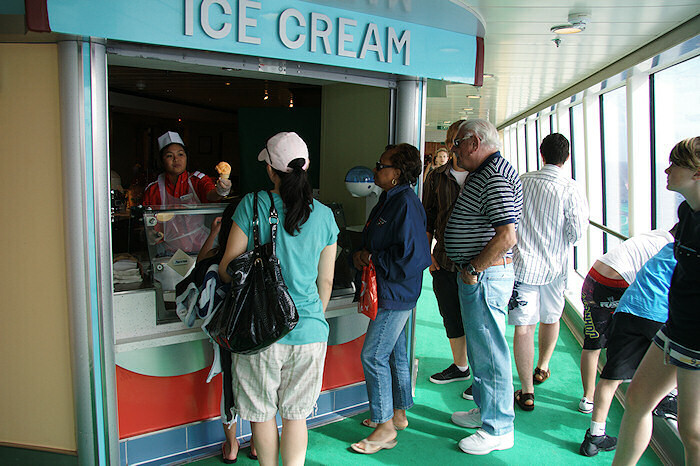 You can make yourself a soft-serve cone at just about any hour on the Elation, but on the Star you can get a real ice cream cone, and several flavors to choose from, too! A much more comfortable bed in the cabin. In fact, it's incredibly more comfortable! Better tasting food! 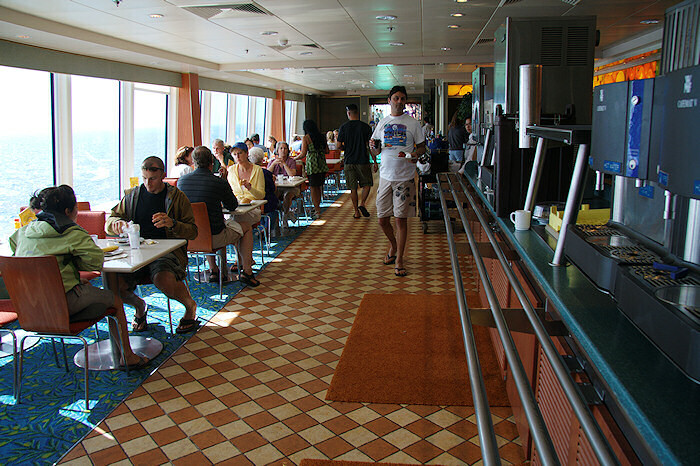 Considering the number of meals you eat on a cruise ship, this is a huge advantage. A smoother embarkation process. We were on the ship in about 20 minutes, versus over an hour with the Star. Larger bathroom in the cabin. More "fun" events during the afternoons. Evenings were fun on both the Star and the Elation, but it seemed like there were more fun things to do in the afternoons on the Elation. Nicer furnishings in the buffet restaurant. Coupled with the better overall food quality, eating at the Elation's buffet restaurant was a much more pleasant experience than eating in the Star's buffet restaurant. The buffet experience on the Star reminded me of eating at the food court at a K-mart store. Soft-serve ice cream available just about any time. While it's true the Star had real ice cream in multiple flavors (which the Elation didn't have) the Star's ice cream window had limited hours. On the Elation, you could make yourself a soft-serve cone at just about any time. And you never had to wait in a line! Please don't get me wrong... 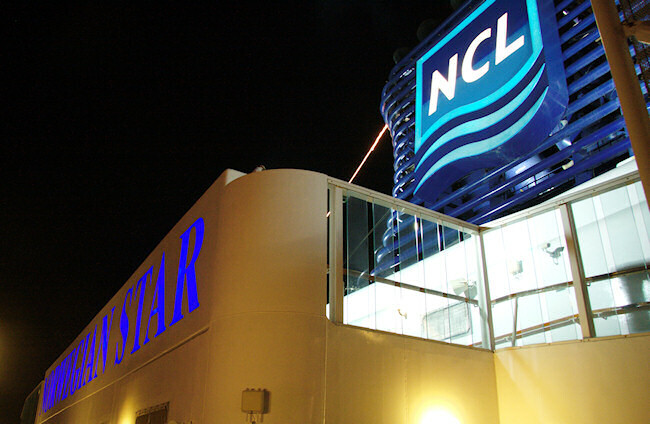 I enjoyed our cruise on the Norwegian Star and I would not rule out the possibility of another cruise with NCL someday! But there is always room for improvement, and I do think that my first choice will probably be to stick with Carnival. 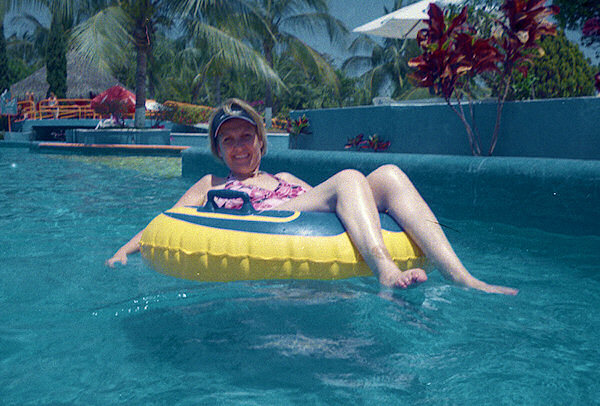 The best example I can give to illustrate how the NCL experience was just a little sub-par to Carnival is to talk about how each one prepared a hamburger at lunch time out by the pool. On Carnival, the bun was toasted on the grill... and the burger and bun were taken off the grill and put together at the last minute just before being put on a plate and handed to me... so that the whole thing was literally "hot off the grill". On NCL, there was a metal tray of pre-cooked burger patties and a metal tray of buns. I grabbed a burger patty myself with a pair of tongs, placed it on the cold bun, and added any condiments I wanted. The bun was never heated, and the burger patty was cooked quite a while ago and just kept warm in a warming tray. The NCL burger was lousy, the Carnival burger was good. 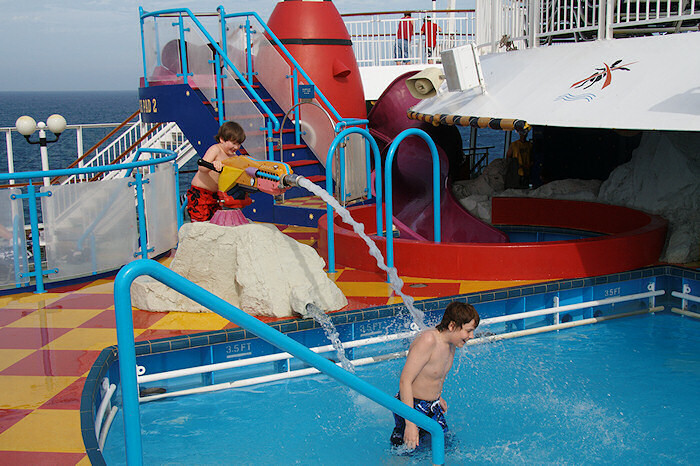 One cruise I would like to take someday soon is the 7 or 8-day cruise on the Carnival Spirit out of San Diego. It's a longer cruise than the 5-day Elation cruise, so you stop at more and better places than the Elation does. Also, the Spirit's main dining room has quite a few tables for two and tables for four... so it's possible to avoid that experience (I hate) of having to eat dinner at a big table with a bunch of strangers. Each day of the cruise, they publish a little newsletter that tells you information about what will be happening on the ship that day. It's called the "Freestyle Daily". If you've never cruised before, you'll find looking at a copy of the Freestyle Daily to be a great way to see the kinds of activities available onboard the ship. I've scanned the Freestyle Daily's from each day of our cruise, as well as the shore excursion order form... which I think you'll find interesting. They are in .pdf format.